THRIVE Premium Lifestyle DFT is a technology driven breakthrough in Health, Wellness, Weight Management, and Nutritional Support. Le-Vel's DFT (Derma Fusion Technology) delivery system is a category creator—the first of its kind—and now, with fusion 2.0 technology, DFT has reached even greater heights. 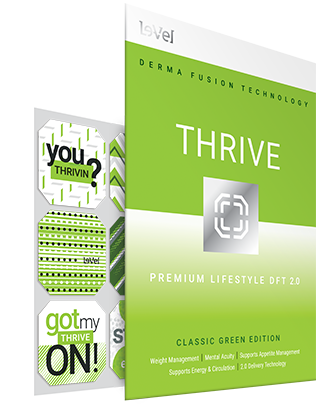 Our DFT delivery system was designed to infuse the derma (skin) with our unique, premium grade THRIVE Lifestyle Formula, different than the Capsule & Shake formula, and to result in a delivery rate benefiting the individual over an extended period of time. Simply put—DFT helps you achieve premium results for a premium lifestyle. With fusion 2.0 designed to provide greater bioavailability, absorption, and nutritional support your results with DFT 2.0 should only get better. When taken as part of the THRIVE 8-Week Experience—in conjunction with the THRIVE Premium Lifestyle Capsules and the THRIVE Premium Lifestyle Shake Mix—DFT promotes clean and healthy weight management and an overall healthy lifestyle. Individuals following this plan will experience ultra premium results, with benefits such as improved health, wellness, and fitness, as well as, weight management and nutritional support.